Lithuania already have a new child and adult rehabilitation methodology. For cerebral palsy rehabilitation, physical condition recovery after a stroke or movement – support apparatus injuries. “Dream” is a new ski program in Lithuania. Dream is a ski/snowboard program for athletes who have physical and or movement restrictions, including Cerebral Palsy. Dream has specialized equipment and methodologies that have aided in the rehabilitation process. Dream participants have to be at least 3 years of age. Many years of experience in the US and Russia confirmed the effectiveness of this program. 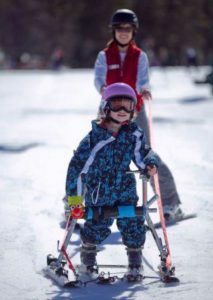 Mountain ski lessons with instructors who knows this methodology allows to accelerate the recovery and rehabilitation of people with disabilities. The human brain and body find themselves in unusual conditions of forced at the same time with unusual speed to perform a number of new tasks. Dream program instructors have been trained in proven methodologies that aid in the recovery of physical, emotional and mental development. In this way, all the body rapidly begins reconstruction and exchange processes. All Dream instructors have completed specialized courses that are recognized by many organizations internationally.